I'm (sorta) linking up with Katie for my first things I learned this weekend.. happy Monday y'all. I learned that one should not run a half marathon without training properly. Stupid, very stupid. However.. it can be done. yay for my slowest ever half marathon! For reals though, this was not a great race. I rolled my ankle at mile 2 and felt like crap the entire time. Honestly though, that's all on me for not training properly, something I am very good at. Regardless, I survived, and officially think I am back on the working out / running wagon. Come at me, bikini season. 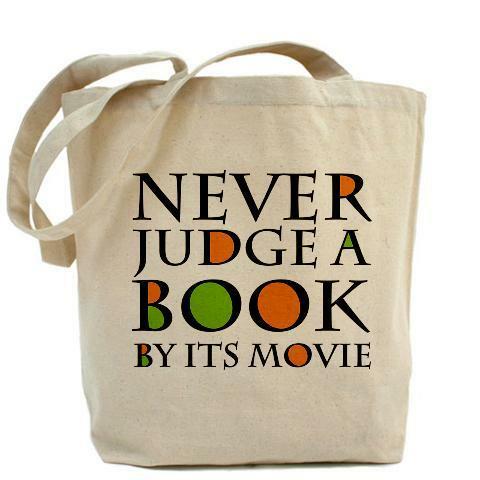 I learned that the book is always better than the movie. I learned that hubby will try and weasel his way out of seeing what he deems is a girly or childish movie. But I stood my ground and dragged him to see it. We both recognised its not Oscar material, but we both enjoyed it. I might have spent the entire movie whispering 'in the book this is what happens' or 'ooh he's a bad guy, I don't like him' or 'want to know why his nickname is Four?' lol. I learned that Australia is effing expensive. Well, I already knew this, but it has been a long time and I make American money now, so it hurt my heart to book some things on the weekend. I booked our flights, hotel + tours for our mini (surprise) trip = a lot of dollars. I learned there is such a thing as too much chocolate. I will eat chocolate if it's in front of me, but have surprising willpower when there are 40 million little reese's and chocolates in my house. The starburst jelly beans didn't stand a chance. I learned that you can break a toe by walking into your bed. And that is not fun. Who knew a teeny tiny little toe could turn so purple and cause so much pain? I learned that I am ridiculously emotional around my period (who are we kidding, I knew this) and hubby wanted to go out and I cried and cried like he was leaving me forever. After he consoled me and I came to my sanity, I went to target. Then I sold some stuff on ebay. I learned that I cannot be held responsible for Mod Cloth's cute clothes and that paypal money spent is free money, and does not count. CAT SCARF!! / PRIDE & PREJUDICE TEE!!! Striped Dress that I have been coveting for 15 years. Have a fantabulous week ladies & gents. Yay, I'm happy you joined in! A fun way to recap the weekend, right? :) Great job on your half marathon - even if it was your slowest you still ran one and I didn't! Great job on a 1/2 marathon! I've done only 1 and want to redeem myself. I certainly didn't train enough either! 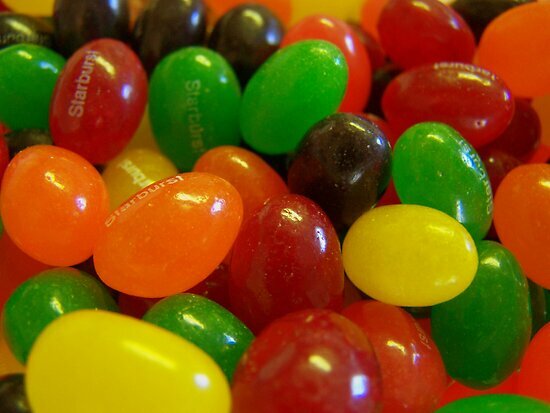 I have weakness for the starburst jelly beans. Starburst jellybeans are the stinking bomb! Congrats on your first 1/2! The hubs and I had one planned for this weekend, but we canceled it because neither one of us ran the slightest bit to call it training in the last few months so we called it a #fail. Good to know it was still possible, yet incredibly painful? 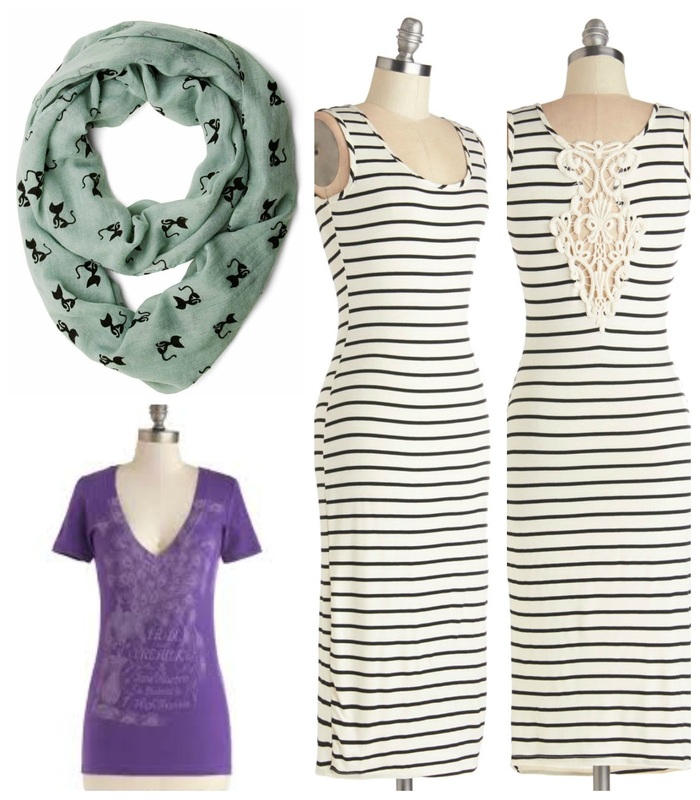 So many cute things from Mod Cloth! 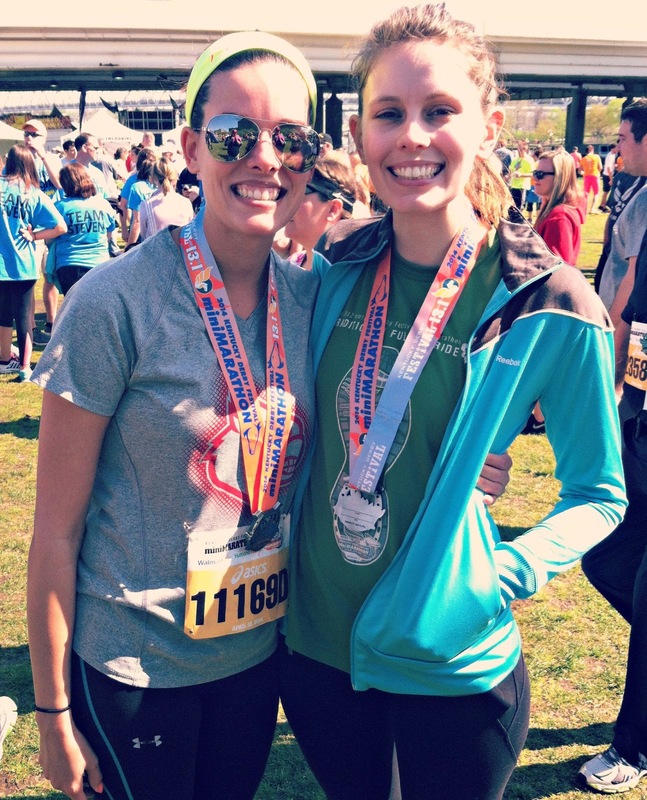 Congrats on finishing the half marathon! I actually didn't have ANY jelly beans this Easter-- though I ate my fair share of reese's eggs so I'm sure that makes up for it! traveling is just far too expensive ! and it's not fair! Oh give me all the Starburst Jelly Beans!!!! I have not purchased those in awhile because I could literally sit and eat the entire bag. YUM! I have broken my toes doing the stupidest stuff! Walking into walls, riding a bike, dancing....you name it...I have broken it that way! Agreed. Books are ALWAYS better than movies. So great you did the marathon! Slowest or not, it's more than I've ever done!! And *ouch! * for your toe! I stubbed mine about two weeks back, it turned colors and pulled a bit of nail off (sorry, gross, I know)- it thankfully did not break - BUT, I feel your pain, I do! Love the Modcloth purchases :) And I agree with the commenter who said you should do a how to sale on ebay post, or something of the like- if you wanted. Starburst jelly beans were the end of me this Easter as well!